When my in-laws told us they had found a new (to them) vegan restaurant in Portland, it wasn’t much of surprise. While the Portland vegan restaurant scene isn’t quite at swing a cat levels of density, many commercial strips of the city’s lovely residential neighborhoods feature vegan eateries. What was surprising is that this place is located in a huge glittering shrine to mass consumerism. Not just any mall but what has to be Portland’s most upscale mall. It was very un-hippie and not what I was expecting to say the least. Any doubts I may have had went out the window when I made inside the restaurant. The fire in the corner was inviting and the staff welcoming & friendly. Everything we’ve tried on our multiple visits has been excellent and I could drink nothing but the watermelon fresco the rest of my life and be happy. It’s so good that I’ll deal with the mall just to eat there. In their own words Native Foods Cafe is “…America’s premier fast-casual vegan restaurant group serving made-from-scratch, chef-crafted cuisine….”. It is currently a smaller chain, concentrated mainly in southern California and Chicago, so you might not be familiar with them but chances are you will soon be, as NFC has an ambitious nationwide expansion planned for the next couple of years. Until then you can see their menu here. One of the things we’ve always liked about NFC is the shirts the staff wears. They tend to be clever, pro vegan statements, with a little self promotion thrown in for good measure. Interestingly enough though, the shirts are not for sale to the public. I’d buy one if they were, but a bunch of lucky readers lucky DFV readers will not have to worry about that. For today’s gift we have 9, that’s right 9! NFC long sleeve t-shirts to give to our readers. Sizes and designs vary, when you leave your comment, please note your preferred size. We’ll do our best to match sizes, no promises, and the design you might receive will be chosen at random. Let’s be clear this isn’t a ‘contest’. We’re giving away gifts to our friends. However the limit quantities available gifts means we need to make some choices. If you want to receive a gift, please leave a comment on the Don’t Fear the Vegan blog post for that day. Commenting on Facebook doesn’t count. Around midnight Pacific time the day after a post, a recipient will be randomly chosen from the comments section. We will reveal the gift recipients in individual posts the following day in a new post, a reply in the comments and a fair attempt at emailing. The giftee will have 48 hours to contact us from the time of post, otherwise we will choose another lucky reader will be chosen who then has 48 hours to get back to us, and so on…. We have learned from past give aways that it is sometimes very difficult to get a hold of folks. Lastly we can only afford to ship within the United States. Sorry the rest of the world. I love pro vegan shirts! I can’t get enough. What a great prize! I would love a small. Super cute shirts!! I love the heart beet one! I wear tee shirts everyday to the gym. I could be a walking advertisement for the ANIMALS. I hope I get this! I LOVE NFC!! It’s my favorite place to eat, and as today is my birthday, I’ll be going there today and definitely getting one of their delicious cupcakes! 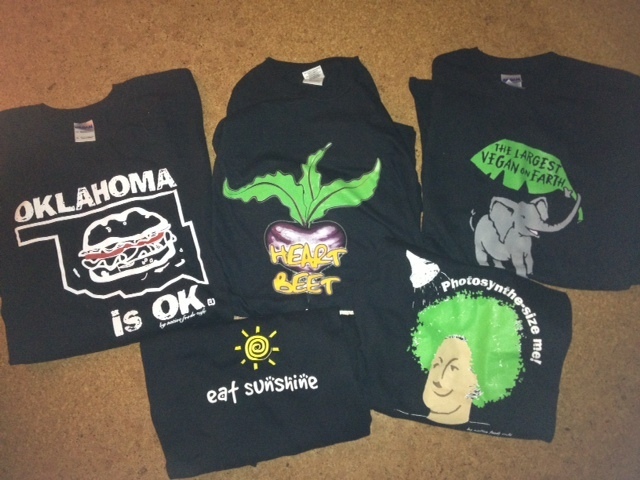 Love all of the shirts, but especially the beet one! I’m a small. I have never eaten at a Native Foods. I hope they come to Cincinnati! I would be happy to wear any of those cool shirts, if you have one that is XXL (or XL, since I’m losing weight at a slow but steady pace). I love Native Foods. I’ve been to one in Chicago and one in LA when I visited my son in Chicago and daughter in LA. And now my son is in Portland, and they have one there. For now I’ll have to visit my kids to get to a Native Foods. Because we DON’T HAVE ONE in Pittsburgh, PA!!! It makes me very sad. We have some very good vegan places but Native Foods would be an excellent addition! By the way, I would need an XL/XXL. But, if you only have a large I could send it to my son in Portland. He would love it. I sent him your info in case he doesn’t know about your blog. He has his own blog. It’s the Vegan Skate Blog. Dying to experience Native Foods but they haven’t traveled to this part of PA yet. I live outside of PIttsburgh.. I would love a large or xlarge for my husband who is a new vegan. I’ve been wanting to try this restaurant because I love supporting any business that embodies the vegan lifestyle.